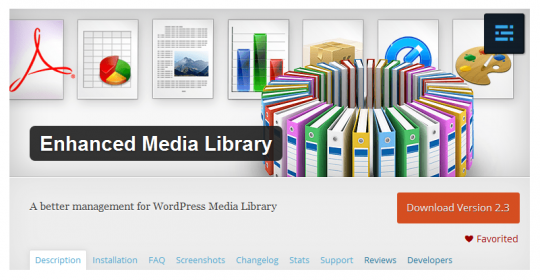 This is a first-look review of the premium WordPress plugin, Enhanced Media Library (“EML”) Pro. I’m building a WordPress powered e-commerce website for a bridal shop. There will be thousands of images to manage. Each image needs to be associated with a particular product. In the world of bridal attire — for those not in the know — a “product” is a particular style of a particular type of attire (usually a gown or dress) from a particular designer. There are dresses for brides, for bridesmaids, for flower girls, and for mothers of the bride and groom. There are headpieces and veils. There are even men’s formalwear items. And many designers offer styles from multiple years. When it comes to bridal gowns and bridesmaid dresses, a designer might offer dozens of styles for each. Each style could have 3-5 images, each displaying a different angle or view. My client sells attire from 7-10 different designers. Do the math. The images add up. To thousands! Obviously, we need a better way to manage images than navigating through hundreds of Media Library screens. I first experimented with the free version of Enhanced Media Library on a client site that had lots of PDF documents. 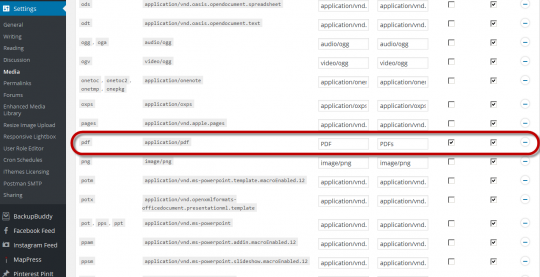 I wanted an easy way to list and browse through only those PDF documents. 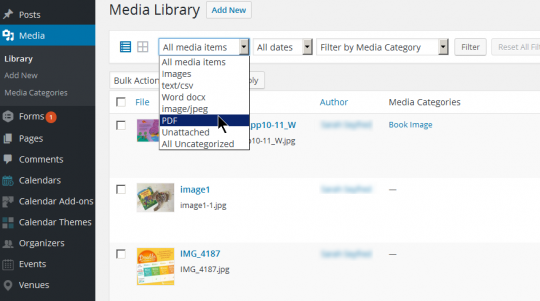 As you probably know, the native WordPress Media Library offers very rudimentary searching and filtering. Search is especially limited. 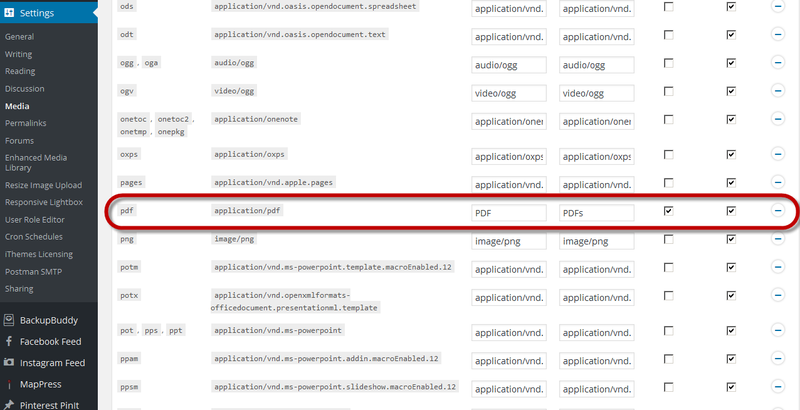 We can search by name, but much to my disappointment, we can’t find all PDF documents by searching for “pdf” or “.pdf”. Filters are also limited. We can filter by date. But the only other native filtering options are “All media items”, “Images”, “Audio”, “Video”, and “Unattached”. 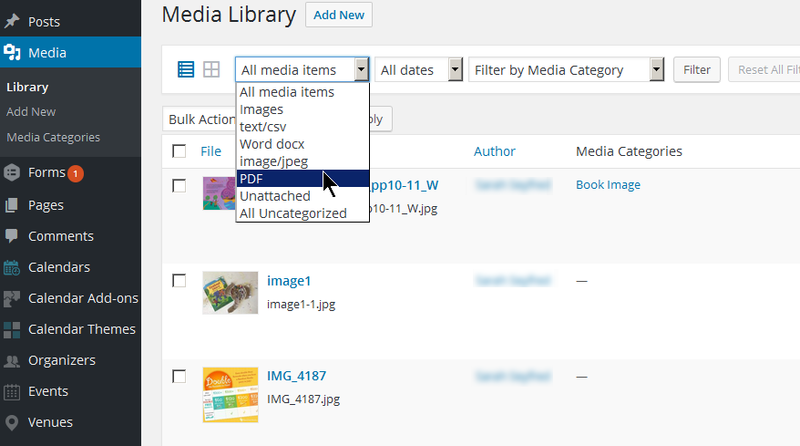 While Enhanced Media Library offers the ability to assign media categories to media files (and to filter the Media Library List according to those categories), it was the plugin’s MIME Types feature — and particularly the ability to filter the Media Library List View by MIME Type — that recommended it to me. and it would appear as a filter in the Media Library List screen. When I started working on the bridal shop site and was confronted by the challenge of managing thousands of images, I explored different ways to organize images in the Media Library by designer and dress type. I thought about renaming all the image files prior to upload with some pattern that would make searching for them easier. I looked into creating subfolders under the /wp-content/uploads/ folder, so that each designer/dress type would have its own folder. 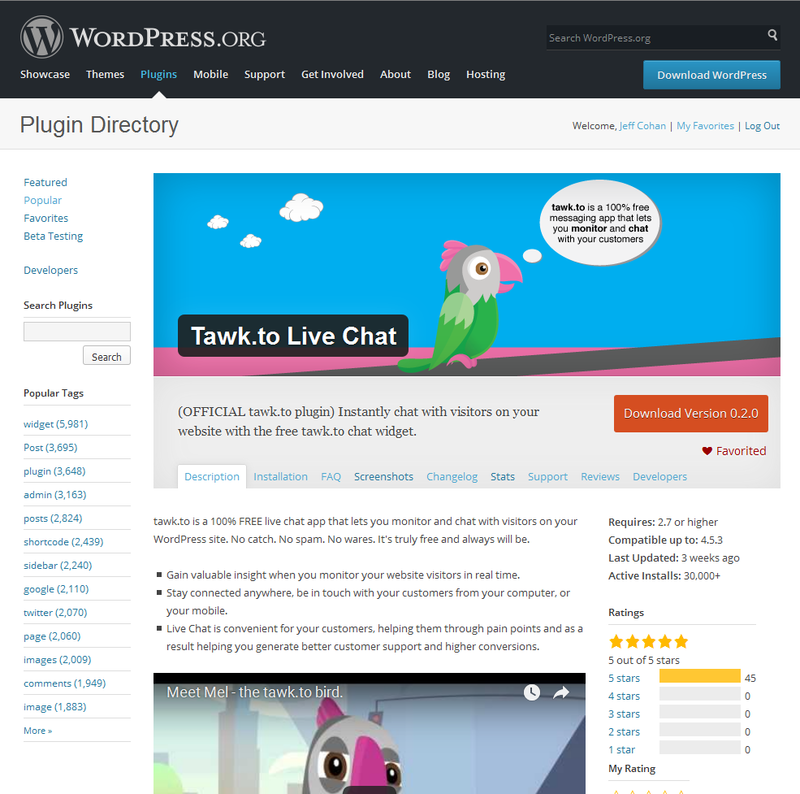 Native WordPress doesn’t support this, but some plugins purport to do so. I also looked at some plugins that update the Media Library from images uploaded by FTP. But then I remembered Enhanced Media Library. The major advantage of the Pro version ($25 one-time fee for unlimited lifetime updates on an unlimited number of sites) of Enhanced Media Library is the bulk edit feature. In particular, the Pro version would allow me to upload multiple image files from one designer for one dress type (e.g., Bridal Gowns from Nancy’s Bridal) and assign appropriate categories to them using the bulk edit feature, once all images are uploaded. Then, when it comes time to add products to WooCommerce, we can easily find the images I need by using Enhanced Media Library’s filtering functions. I can’t remember the last time I was so eager to spend $25. I’m still in the early stages of working with the plugin. But I can tell you that I’m very happy with Enhanced Media Library Pro. 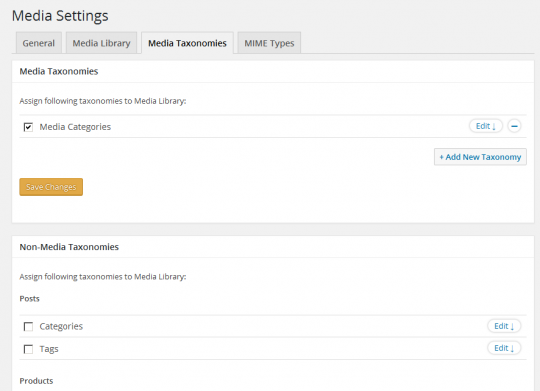 Support for custom taxonomies is going to make our work so much easier. 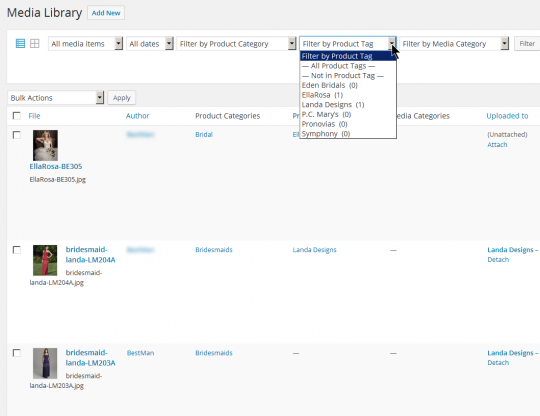 Setting up filters — even for custom taxonomies — was easy. First, I went to Settings -> Media -> Media Taxonomies. Then I found the Non-Media Taxonomies that EML auto-detects. I checkmarked Product Categories and Product Tags and clicked their “Edit” buttons to expand the sections. Then I checkmarked the first three settings for each taxonomy. 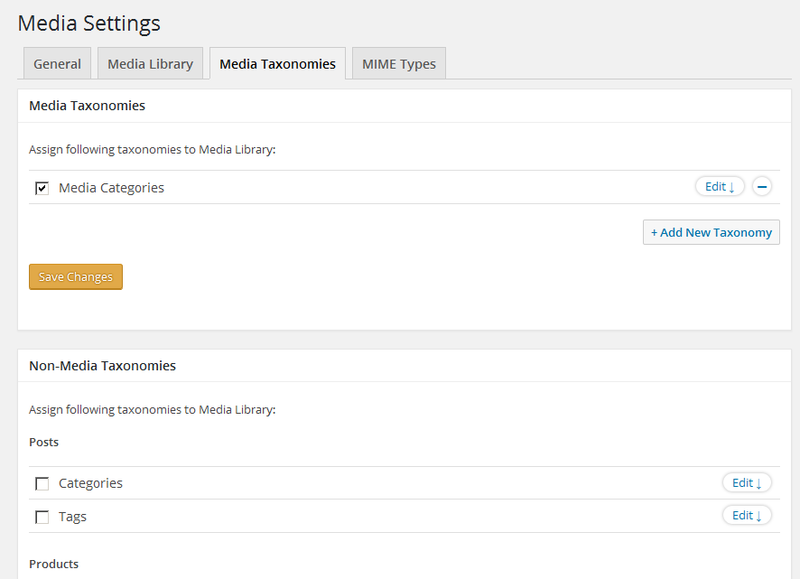 Enabling these settings make the taxonomies available in all contexts in which I would need them: Media Library List View, Media Library Grid View, and when adding or editing an image in a post. This is a very cool feature that’s even available in the free version of the plugin. 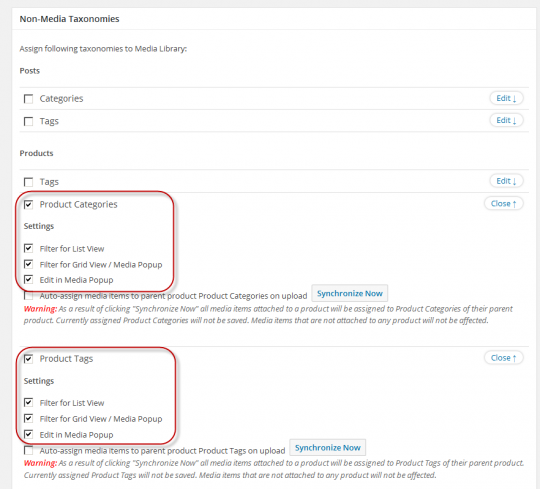 EML extends the functionality of the native WordPress gallery shortcode so that you can dynamically generate image galleries and/or audio/video playlists by specifying options that correspond to any of the Media Library filters — and most importantly, to the taxonomies. 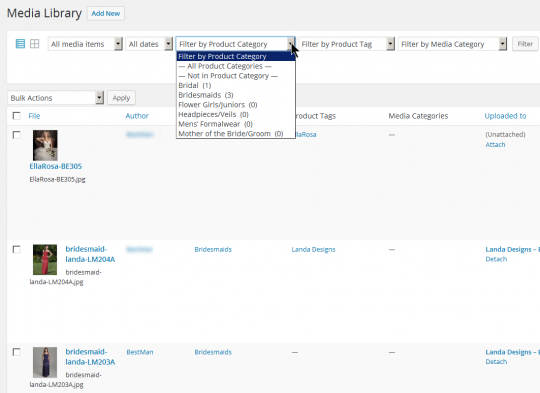 Create a media category called “Screen Shots” (assume WordPress assigns that category the id of ’12’). Whenever you upload a new screen shot, assign it to the “Screen Shots” media category (or retroactively make those assignments for previously uploaded screen shot images). 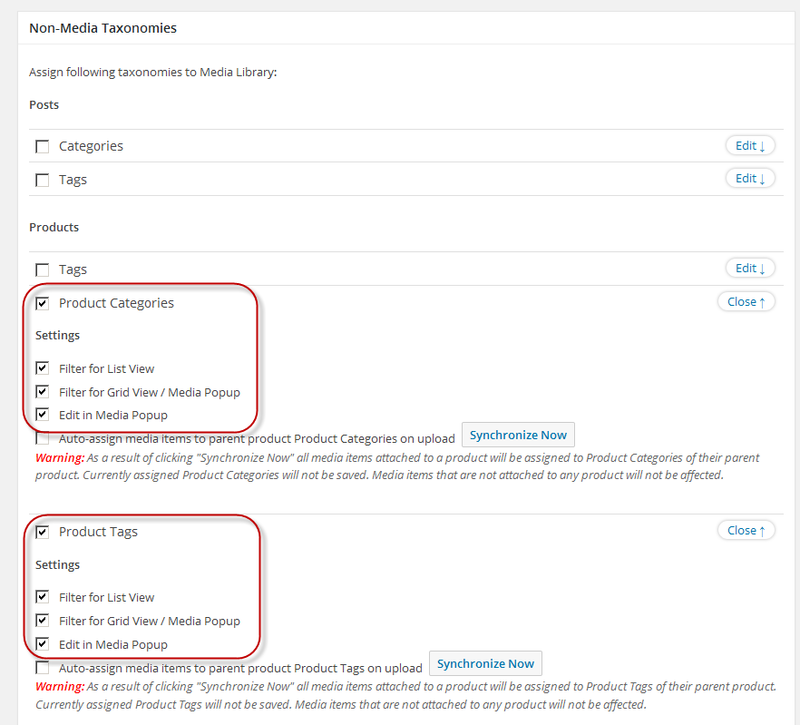 Note #1: The media_category and limit options are added by EML; the orderby, columns, and size options are part of the native WordPress gallery shortcode. Note #2: The plugin authors warn of potential conflicts with other gallery plugins. Note #3: With the Pro version of Enhanced Media Library, you can use the plugin’s UI to generate the gallery: just choose the filters you want. 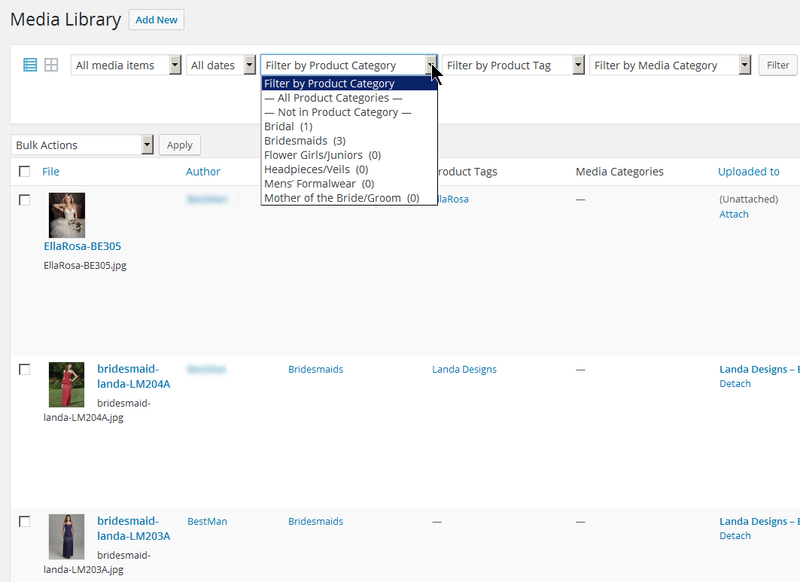 The plugin is very intuitive, But I did run into a problem getting my custom taxonomies (product category and product tag) to show up as columns in the Media Library List View. So I submitted a support ticket, and I received a prompt reply with code to add to the functions.php file in my mu_plugins folder. 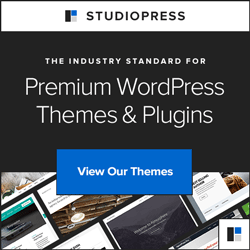 The plugin authors have indicated in the support forum that the free version of the plugin will have a limited set of bulk-edit features included soon. 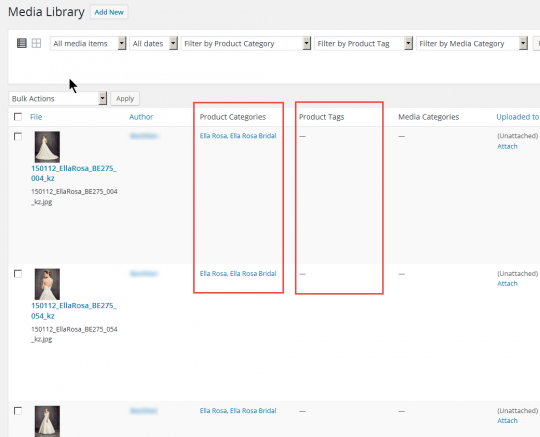 According to the plugin author, the bulk-upload/bulk-edit process will be improved soon. Namely, we’ll be able to select the taxonomy/ies to which we want to assign a batch of images prior to uploading them. This might seem like a small thing, but from a workflow perspective, it makes much more sense to have the simple/quick process (choosing categories) come before the potentially much longer process (uploading many megabytes of images). If you have a WordPress Web site with more than a few images, and you find the native Media Libary lacking in functionality and convenience, I heartily recommend that you install, activate, and configure the Free version of Enhanced Media Library now! 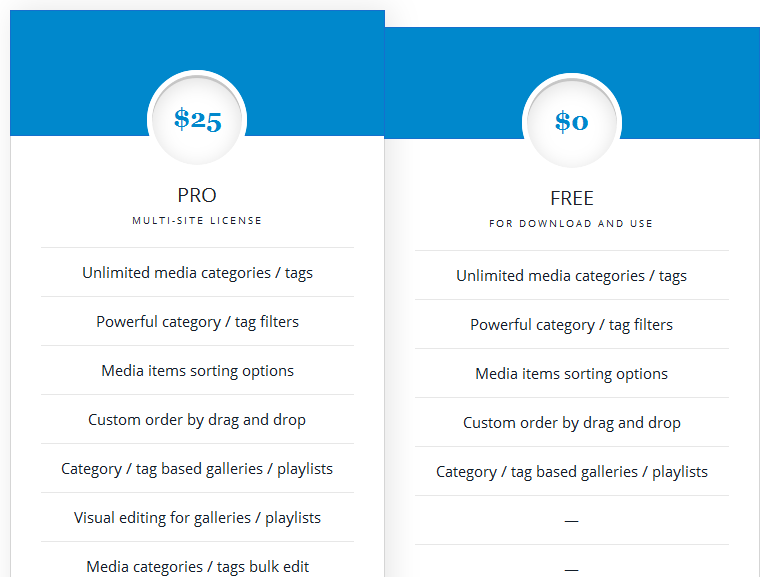 If your site has a real lot of images, and you’re a mis-en-place kind of person who likes to have things neatly organized, I don’t see how you can go wrong dishing out $25 for Enhanced Media Library Pro. Go get either the Free or Pro version of Enhanced Media Library from here now. Tell Nadia Jeff sent you. Feel free to question and comment below. I may add updates to my first look as I continue to work with the plugin.